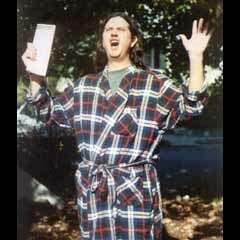 ...Years later it would be known to the world as The Plaid Bathrobe of Turin. --Torc. Every police cadet had trouble on the firing range deciding if they should shoot pop-up #5. --Torc. Man, Doctor Who looks worse and worse with each regeneration... --Pog! ebay #58934110: L@@K!!! Slacker love doll!!! LIKE NEW!!!! NR!!! --Torc. In his second year of Chinese Language Correspondence School, Jeff learns that his last take-out receipt includes one order of That's not Chicken and a bowl of Piss in Round-Eye's Wontons. --Torc.